While you are adding all these Agency Power parts to power up your Ford Focus ST, you might as well add some style to it as well. Agency Power has this beautifully finished carbon fiber radiator shroud cover available for the Focus. The black plastic cover is attached to the front bumper so this carbon fiber piece is a cover that can be attached via thin double sided tape or rtv silicone. It allows for the factory latch release to be installed and secures with the factory black plastic clips. This shroud cover can be done in 1x1 or 2x2 carbon fiber weave and features a glossy clear coat finish. This part is made in the USA. Please check availability as sometimes they are made to order which can be up to 2 weeks. As aways if you find a better price contact me about price matching. Do you know of any other shops making this rad. cover? Been trying to get this cover and no one seems to be producing anymore. The one shop I did have on the line says AP had one but is no good and seems they do not have any mindset on making anymore of them. 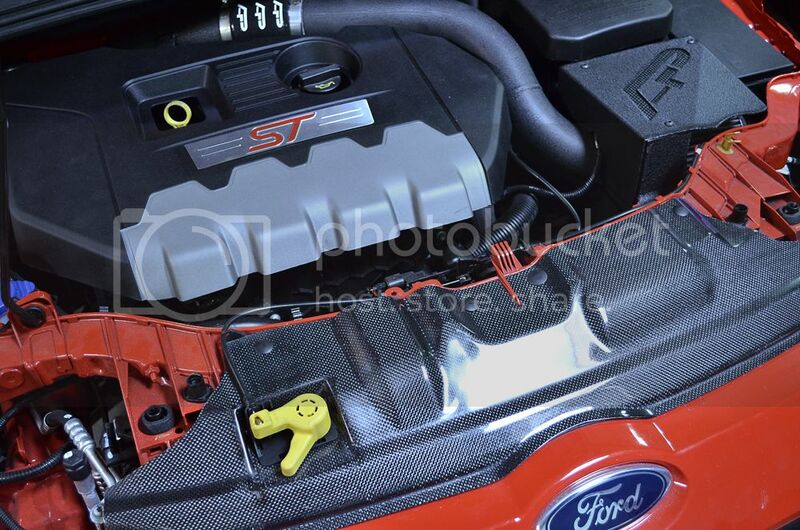 Focus ST Carbon Fiber Hood?